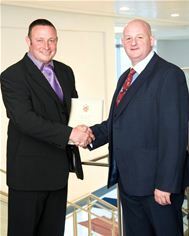 29 JULY 2015 – Lee Clinton, Senior Operations Manager, telent Rail, has been awarded a Certificate of Merit by the West of Scotland Branch of IOSH (Institution of Occupational Safety and Health). The awards, for non-safety professionals, recognise those considered to make valuable contributions to safety in their organisations. Lee is responsible for the installation and commissioning of the radio infrastructure for telent on the RETB (Radio Electronic Token Block) Next Generation Radio Signalling project, currently being deployed in Scotland on the West Highland Line and Far North Line on behalf of Network Rail. The deployment involves dealing with many hazards: working at height, working with electricity, off-road driving to exposed hillside locations and receiving large deliveries of equipment, materials and people. The work is often hampered by poor mobile reception and extreme weather conditions. Lee put together a carefully thought out plan, identifying and planning for risks in order to ensure the safety of his team. The plan included training for the environment, professional off road driving courses, regular vehicle inspections, additional special PPE requirements and issue of Personal Locator Beacons. The telent team also worked with Mountain Rescue representatives when dealing with the highest Network Rail Asset, located at the top of White Corries in the Cairngorms.